Five wedding ceremonies neatly arranged on double page spreads as above. 1. An unbelievably low price. 3. 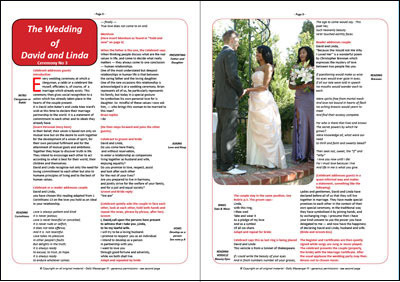 Five totally different wedding ceremonies, on five double page spreads. 4. In full colour. Beautifully set out and designed. 7. Guideline articles on preparing for, and organising you wedding ceremony.